Enter into your mind’s inner chamber. Shut out everything but God and whatever helps you to seek him, and when you have shut the door, look for him. Speak now to God and say with your whole heart: I seek your face; your face Lord, I desire. (St. Anselm of Canterbury, Proslogion. The Liturgy of the Hours II. Advent and Christmas Season, p.184). The words of St. Anselm of Canterbury seem so simple. If only it were that easy to shut out everything else but God. Life. Money. Facebook. Children. Spouses. Work. Anxieties. All of these have their rightful place, but, when they become an end in themselves, they lead us away from God. 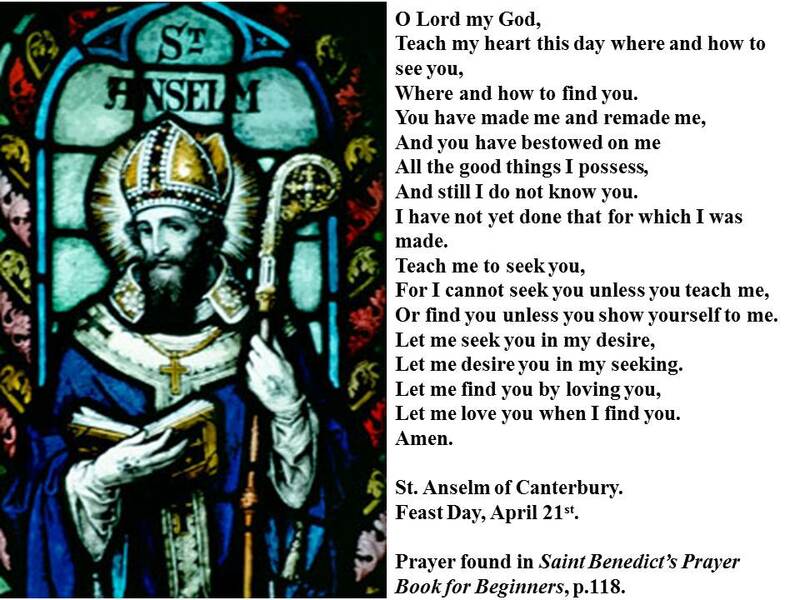 St. Anselm was a monk, an Abbot, a university professor and later an Archbishop of Canterbury. He had his share of enemies within the civil government. St. Anselm was also an intellectual fellow. Yet, even he in all of his theological brilliance, had a deep spiritual center. His secret was those moments in which he shut everything else out, to let God in to keep on bringing him closer to God in his desire and love. Advent is such a great time to enter into a deeper life of prayer and contemplation. All the hustle and bustle moving us towards Christmas can be overwhelming; if we allow it to become our center. In this Season of Advent, we are encouraged to keep watching for the coming of Christ. One of the ways we can do that is to be sure to set aside some time in which we shut everything that draws us away from God out, and allow God alone to speak to our hearts. This is so very difficult, because we are not just talking about the outer noise. There is also all that interior noise that shuts God out of the heart. God invites us through these words of St. Anselm to an interior silent surrender of everything into God’s care while we spend time with the Holy Spirit in the depths of our whole selves. Are we ready to accept that invitation?